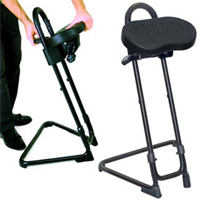 This sit-stand chair offers 10" of continuous height adjustment using the Lyon Gravity Lock System, featuring postive locking at the set height. The chair is stable with four strong nylon anti-slip glides which provide stability on most flooring. The ergonomically formed padded polyurethane seat tilts forward up to 20° and swivels 16° in either direction and automatically returns to the center when released. The matte black tubular steel base is durable and looks professional in industrial and office settings. Maximum load rating: 250 lbs. Warranty through manufacturer. Height Range: 22.75" to 32.75"